After years working on a cabled observatory that monitors the Pacific Northwest seafloor and water above, a University of Washington engineer decided to share the wonder of the deep sea with younger audiences. 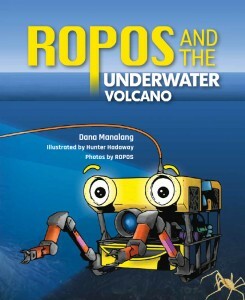 The result is “ROPOS and the Underwater Volcano,” published this month by Virginia-based Mascot Books. 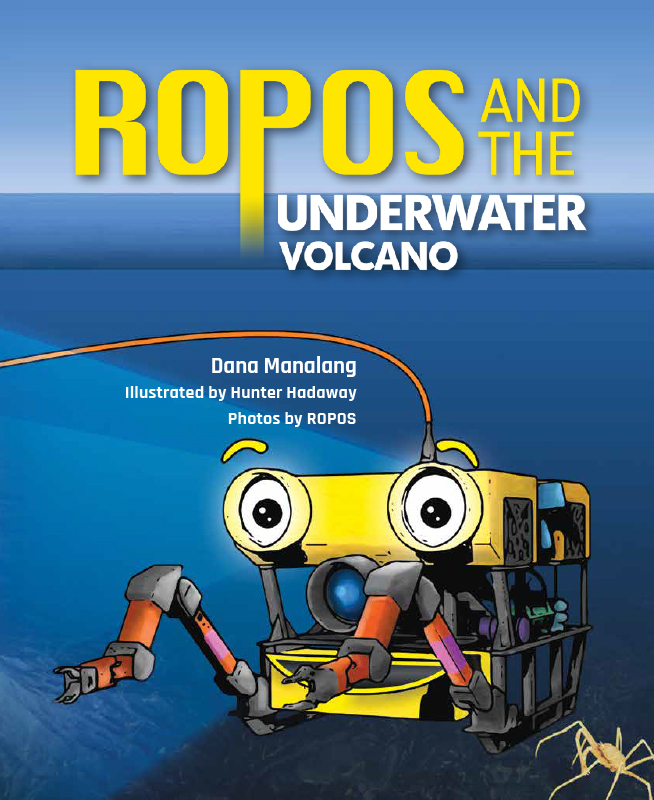 The book combines images of the deep ocean captured during UW School of Oceanography research cruises with rhyming couplets and a cartoon robot illustrated by a UW graphic designer. Most of the photos were taken off the coast of Oregon and Washington by the book’s main character, ROPOS: a deep-sea robot that braves near-freezing temperatures and crushing pressures to attach instruments beneath as much as 2 miles of water. The Canadian robot, whose full name is the Remotely Operated Platform for Ocean Sciences, captured the images while installing and maintaining the Ocean Observatories Initiative’s Regional Cabled Array, a high-tech marine observatory led by UW professors John Delaney and Deborah Kelley. Deep under the water there are volcanoes. Of a volcano that sits between tectonic plates. That page, of course, features a depiction of Axial Volcano, the observatory’s centerpiece. 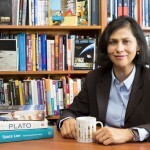 Manalang’s day job includes helping researchers worldwide prepare instruments that will connect to the ocean observatory. She said she saw an opportunity to inspire very young audiences with the reality of modern oceanographic research. 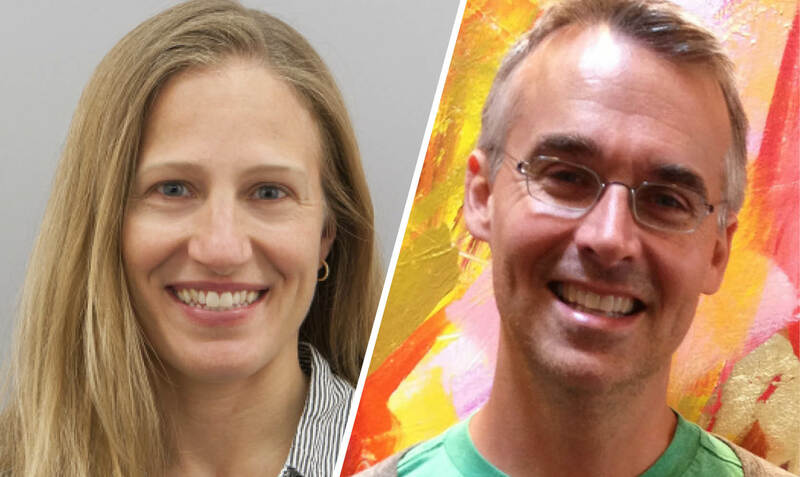 The book’s illustrations and graphic design were done by Hunter Hadaway, creative director at the UW-based Center for Environmental Visualization. The center provides much of the graphic design for the cabled observatory, and the book is dedicated to a former member of the team. The book is a product of Robots Discover!, a project that Manalang, a mother of two, founded to share “the thrill of robotic exploration through storytelling and engaging content.” She has also posted free activity sheets that accompany the book’s content, and she will be visiting local schools to talk about working as an engineer. Manalang and Hadaway will be at a kickoff event 6 p.m. Oct. 25 at the University Book Store. For more information, contact dana@robotsdiscover.com.